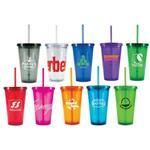 The 16 oz Melrose Acrylic Tumbler custom printed with your design or logo from Adco marketing makes a great tradeshow giveaway item that is sure to please any client. 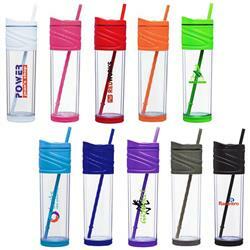 Made with a double walled design and available in ten fun, bright colors, it also has a dual purpose swivel lid for drinking from the spout or from a straw. A sure fire promotional tool that will have your name on everyone's lips. Available Colors: Clear, Blue, Apple Green, Purple, Graphite, Tangerine, Red, Aqua Blue, Green and Fuschia. Production Times Available: Standard 5-Day Production with Paper Proof. Available Imprint Options: Spot or full color imprints.